The Farwell Building is my favorite vacant office building downtown. I'm a sucker for Chicago School type office buildings. The building's ornate lobby and wonderful lightcourt add to its charm. 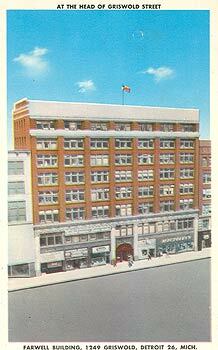 Years ago I found some mid-90s promotional material advertising the building's conversion into lofts. It highlighted the building's unique features such as Tiffany elevator grills, fine walnut fireplaces, Tiffany light fixtures, etc. Included where photographs of these items still in place. However, when I visited the building shortly afterwards I found only scars where the ornamentation should have been. Sadly a major selling point of the building is now lost. The building does appear to be structureally sound. The lobby marble, large windows, and handsome light court remain to be restored. The building could still offer much as a residential complex. Hopefully the activity on Woodward, Washington Blvd, and the Book-Cadillac will spill over to the Farwell.